Fr Hunwicke's Mutual Enrichment: blessed Charles Stuart. A Beatification last Saturday. blessed Charles Stuart. A Beatification last Saturday. And it's no good you writing to complain that, since the cult of blessed Charles has never been sanctioned by a Vatican decree of beatification, I am being Inappropriate. You will notice that I carefully use a lower case b. A neat ecumenical compromise, yes? And ferocious Anglicans can put their pens down, too: in the forms of service used for some three centuries in the Church of England, he is never once called 'Saint'; always 'blessed'. So there was no precedent for the Victorian romantics (such as the Bateman in Blessed John Henry Newman's Loss and Gain) who took it upon themselves to canonise him. In the seventeenth century, in any case, the practice of local Western churches, simply by a decree establishing liturgical texts, beatifying their own for a local cult, was not quite extinct. So it is an ecclesiological question that we have here, rather like that concerning Orthodox Saints canonised since the schism. One may, surely, hope for an ecumenical and ecclesiological climate in which King Charles may achieve the style Blessed Charles; in which he will be regarded as the Ordinariate's Gift to the whole Catholic World; in which the King's weakness in giving his assent to Acts of Parliament under which Catholic priests were cruelly martyred ... to an Act of Attainder under which a loyal servant of the Crown was executed ... will be seen as moments in his growth into holiness and the eventual strength of Martyrdom. If it had not been for blessed Charles, would there now be an Ordinariate? But blessed Charles should be seen in a broader context than he so often is. In one his purplest passages, Gregory Dix wrote of the Eucharist as "inextricably woven into the public history of the Western world. The thought of it is inseparable from its great turning points also. Pope Leo doing this in the morning before he went out to daunt Atilla, on the day that saw the continuity of Europe saved; and another Leo doing this three and a half centuries later when he crowned Charlemagne Roman Emperor, on the day that saw that continuity fulfilled. Or again, Alfred wandering defeated by the Danes staying his soul on this, while medieval England struggled to be born; and Charles I also, on that morning of his execution when medieval England came to its final end." We set King Charles beside other monarchs ... S Charlemagne (last Tuesday was the 800th anniversary of his death, as my copy of the splendid Papa Stronsay Calendar reminded me); Louis XVI, who died (his obit only a few days ago) in the revolutionary holocaust of 1793 ... the Blessed Emperor Charles of Austria ... who evoke for us Christian Europe; the Europe which the preamble of some European treaty of union wished (as in Orwell's 1984) to expunge from the record and the memory; the real Europe; the Europe of the Christian Social Realm in which men struggled, not always successfully but not always unsuccessfully, to maintain the principle of the Kingship of Christ - that Lordship emphasised by popes such as Pius XI in his Quas primas. 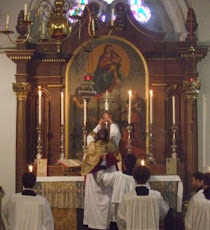 This is Magisterial teaching which Vatican II, in its preamble to Dignitatis humanae, maintained when it decreed that it integram relinquit traditionalem doctrinam Catholicam, "leaves entire traditional Catholic doctrine on the moral duty of men and societies toward the true religion and toward the one Church of Christ". By a chance, tomorrow is the memorial, optionally, in Naples, of one of blessed Charles' descendants who was beatified only last Saturday in the Basilica of S Clare in Naples by Crescenzio Sepe, Cardinal Archbishop of Naples. Blessed Queen Maria Christina of Savoy was the daughter of Victor Emmanuel (de jure King of England, Scotland, France, and Ireland, 1819-1824) and sister of Maria Beatrice (de jure Queen Mary III and II of England, Scotland, France, and Ireland, 1824-1840). Blessed Maria Christina was married to Ferdinand II, King of the Two Sicilies, and mother of Francis, last King of the Two Sicilies before the Piedmontese usurpation. Her Eulogy describes her as 'a prudent counsellor of the King and a true Mother of the poor and needy'. She was also a woman of great modesty. She died in childbed when she was only twenty four. Here is her Collect, discovered on the internet by Fr Andrew Starkie, a learned priest ... needless to say ... of the Ordinariate. Deus, qui in figura huius mundi beatam Mariam Christinam prudenti ardentique caritate decorasti et artificem in augmento Regni tui effecisti: tribue nobis, eius exemplo et intercessione; ut de vero amoris tui thesauro benefacientes accipere valeamus. Per. The banquet which followed the Beatification, hosted by the de jure King of the Two Sicilies, was, by all accounts, a very ancien regime occasion ... Golden Fleeces wall to wall ... I bet the Holy Father would have loved to have been invited ... I wonder how many of the descendants of blessed King Charles, through his prayers, are within the Church's catalogus Sanctorum et Beatorum. A reader wisely suggests the good sense of considering today the Eikon Basilike of blessed Charles. If you do this on Wikipedia, it might help you (since the translation given there of the Latin is erroneous gibberish) to have a transcription and rendering of the main sentence about the Three Crowns, which is divided up into different places on the eikon. The word coronam/crown is not expressed in the Latin because it was thought to be sufficiently indicated by the iconography. For ease, I have inserted it in square brackets. Beatam et Aeternam Caeli [coronam] Specto; Asperam et Levem Christi [coronam] Tracto; Splendidam et Gravem Mundi [coronam] Calco. I behold the blessed and eternal [crown] of Heaven; I handle the rough and light [crown] of Christ; I trample the splendid and heavy [crown] of the World. The three crowns are respectively labelled Gloria; Gratia; Vanitas. The iconography and ideology of the eikon are in the spirit of a Jesuit work published in Antwerp in 1627 and reproduced in English as the Emblemes of Francis Quarles in 1635: which became very popular, and about aspects of which I published a paper in 1993. For just one happy decade or so, under this monarch, England and Scotland, especially their Recusant Gentry and Nobility, were part of the mainstream of Continental, Baroque, Counter-Reformation piety. Hmm, I'm not too sure about these "de iure" monarchs, Father. The ancient custom of England, before the Norman Usurpation, was for the Witenagemot to choose the King. Abbot Aelfric of Eynsham wrote "No man can make himself king, but the people has the choice to choose as king whom they please; but after he is consecrated as king, he then has dominion over the people, and they cannot shake his yoke off their necks." So whatever the legitimacy of the deposition of James II, once he was dead it surely fell to the Parliament of the realm, as successor to the Witenagemot, to choose a successor. The succession of English monarchs can only be a matter of English Law, not Divine Right (whatever the Stuarts may have thought). May I congratulate you, father, on a very fine, very moving post on King Charles. Beate Carole, ora pro nobis! Before beautifying Charles Stuart! there are two other monarchs whose cause is stronger. The first is king Alfred, truly called the Great. There is no other king of England that can touch him in terms of his piety, his Christian charity, his defence of Christianity and his good governance. The second is Mary, Queen of Scots, who died as a martyr. I know that you consider her as Mary II of England, Father, and so do I. There is also the case of Catherine of Aragon. Granted she was not Queen outright, but she has a mighty strong case. Not to mention King Henry VI, for whom a campaign was up and running back in the 70s and 80s, involving both Catholics and Anglicans, who could testify to two veritable miracles involving his intercession. Msgr Ronald Knox and Shane Leslie did an edition of the records of the miracles of Henry VI.The society flourished with a lot of published literature,including a prayerbook, all the 1970s but I suppose everyone involved is now dead. This was the same Charles who re-promulgated the Thirty Nine Articles and took the Covenant wasn't he? Not exactly a monarch with the Catholic leanings attributed to him. "This was the same Charles who re-promulgated the Thirty Nine Articles and took the Covenant wasn't he?" Charles I did, however, reissue the Articles in 1630, prefixed by 'His Majesty's Declaration' which, with its imposing on interpreters "the literal and grammatical sense" of the Articles, proved in later times to be so useful both in undermining Calvinist glosses upon them and in enabling Catholic ones. This, I think, should be credited to his favour rather than held against him. Would JH Newman have been aware of and have used this Caroline history of the Articles in his Tract 90? I am always instructed by your excellent commentary. Yes, Peregrinus, undoubtedly - and I'm sure he would have aware of, and most likely have perused, Francis Davenport's (aka, Franciscus de Sancta Clara) huge tome *Deus ... Natura ... Gratia ...* (1634) which attempted to interpret the 39 Articles in a way rather similar to what Newman attempted in his Tracy 90. What has happened to the cause for Henry VI ? Does anyone know ? It seem a pity that his cause should have been broken off because of 1535 And All That. One Catholic source lists Alfred the Great as Blessed - which is surely very appropriate. He would make an ideal Patron of England.